I have always, always loved fashion magazines. Every time a new issue hits the shops, I devour it in less than fifteen minutes hunting for inspiration and interesting finds. For me, magazines are treasured objects with their shiny pages, beautiful images, colours and incredible ideas. Perhaps I’m a bit old school, but I just cannot imagine a magazine without paper. 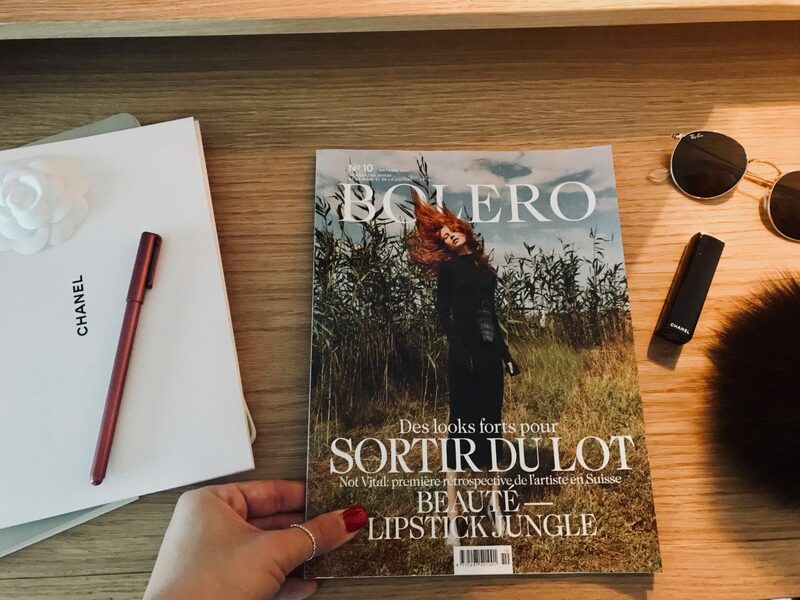 Not only do I like to read them, I love to keep them too ;-) So of course, when Bolero magazine contacted me for an interview this summer, you can imagine my thrill and excitement! On Monday 21 August, my showroom was gleaming and ready to welcome Francesca (the journalist) and Léa (the photographer). There was no special brief. I just needed to be myself and prepare outfits which best reflected my personality. We started with a short tour of the showroom – and of course the dressing room. Léa and Francesca are two absolutely adorable people. The interview went great and we laughed a lot throughout the day. I gave them an insight into my world, shared a few tips and explained my methodology. I should point out here that I’ve been working for a branding agency for several years now. Being surrounded by creative people and working on company brand images all day have been a natural inspiration for creating my approach. My aim? To help clients define their own personal brand, with tailored support focusing on style and personality. It’s not about setting rules, but rather giving tips within everyone’s reach to make image a powerful tool for feeling good about oneself, saving time and money. Click on the link to read the article and of course, don’t hesitate to send me your comments.